Gareth Huw Davies - Could King's Cross grand approach be an inspiration for a remade Euston? 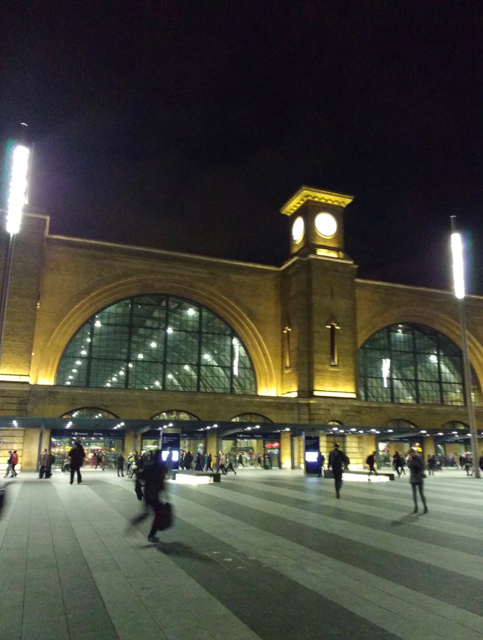 Could King’s Cross grand approach be an inspiration for a remade Euston? This isn’t Euston station. That’s too much of a mess to be worth showing in a photograph. But plans are afoot for big improvements up there, and King’s Cross, just down the road (seen here in early 2017, should be the inspiration. The wonder at King’s Cross is the space. There is no cluttering structure, just a wide expanse in front of the station facade across which you may hurry, or saunter, or simply take in the magnificence of Lewis Cubitt’s station, which was obscured by building from shortly after it was completed in the 1850s until 2013. Uniquely in London you may look in from the top deck of a passing bus and see trains about to depart for the distant north. People are talking about restoring the Euston Arch, at the station just half a mile away on Euston Rd. Even a facsimile would be some recompense for the vandalism of the 1960s when it was summarily demolished. That just might make Euston station grand again.